I first reviewed Revenge Is... last April and love what they stand for. I contacted the company again to be part of my Fall fashion event and they sent me three very cute shirts! They are the red wolf shirt, mushroom shirt, and the education shirt shown in this post. I love the shirts and the company is very nice to work with! Here is some information about Revenge Is... "Our products deal with important social issues of today while displaying simple yet meaningful ways to enact change from the landfill up. To start, our T-shirts are made from a blend of recycled plastic bottles and/or organic cotton. Our reusable hybrid coffee/tea mug, eco-spout and tuck away bag enable each of us to significantly reduce our use of the plastic water bottles, Styrofoam cups, and plastic grocery bags that clog our landfills. They also reduce our need for paper cups and hot sleeves and paper grocery bags. By wearing our products, you will be a billboard for change and inspire others to participate in helping to make our world better." Also, 5% of their net sales are donated to charity. My opinion of these shirts is that they are amazing quality. They are the softest t-shirts that I have ever had. My favorite of these three is definitely the red wolf one because wolves are my favorite animals and the shirt has a great fit. At first, I chose the zebra tee but am very glad that the company chose to send me the wolf one instead. 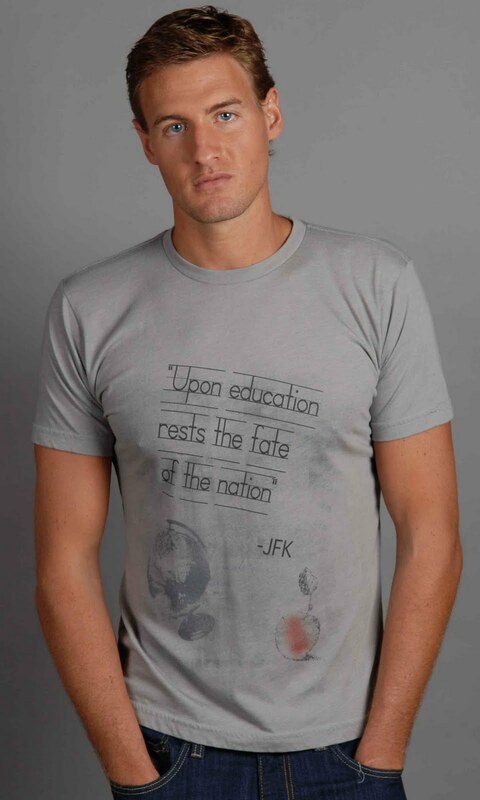 My husband loves his new education tee as he is a teacher. He thinks that the quality is great also. These shirts run from around $45-50 each. I love what the company stands for such as supporting endangered animals, eating your veggies, education, the earth, etc. The giveaway will be for any t-shirt in the winner's choice from Revenge Is... to one lucky reader of The Nutritionist Reviews. The giveaway is open until Midnight on Tuesday September 6th. Winner will be chosen on Wednesday September 7th using Random.org. The winner will have 48 hours to respond or a new winner will be chosen. Visit the Revenge Is... website and let me know which shirt that you would choose if you won. -Like Revenge Is... on Facebook (1 entry). -Write on the Revenge Is... Facebook page that The Nutritionist Reviews sent you (2 entries). Wow! Really cute shirts for really great causes. I adore the Mushrooms - Eat Your Veggies yellow shirt! I "like" your FB page as Danielle Villano! Thanks! I want the Bell peppers! So cute! I would choose the Pacific Pocket Mouse. Thanks for the giveaway! to pick just one. So meaningful, each one sends a great message. You are lucky to get one ! I would choose "Exstinction is forever" in womens . Very spiritual to me. I like the you are what you eat shirt and the earth day shirt. I really like the style and will be checking this brand out. I entered the Handful giveaway. Wrote on Revenges facebook wall you sent me ! I let Revenge Is... know you sent me! 2-I let Revenge Is... know you sent me! I like "Revenge Is..." on Facebook as Danielle Villano! Thanks! I posted on their FB wall as Danielle Villano! Thanks! I like the African Elephant--Exploited t-shirt! I wrote on Revenge Is...'s FB wall! I would choose the Men's RPET - Peace shirt. 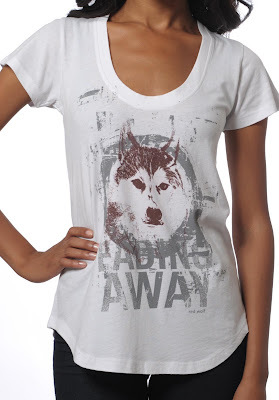 I follow on ahconlon(at)gmail(dot)com and think the Fading Away shirt is amazing!!! I would choose the Save Some For Us t-shirt. I would choose the 349 AND COUNTING t shirt, what a great message this company has! I like the Save The Rainforest t-shirt. I love the MUSHROOMS - EAT YOUR VEGGIES t-shirt. I love the "Eat Your Veggies" (teal slouch) shirt, and would wear a women's medium. Thanks for the fun contest! I'd get the men's Earth Day tee if it comes back in stock. I would probably choose the CARROT - VEGGIES ARE BETTER tee. I would pick the women's grey RPET blank tee. I'd get the men's long-sleeved tee "My sin is my skin". I like the BELL PEPPERS tshirt! If lucky enough to win, I would choose the "Extinction is Forever" shirt! I Like Revenge Is... on Facebook (Dara Nix)! I Wrote on the Revenge Is... Facebook page that The Nutritionist Reviews sent me(1/2 entries). I Wrote on the Revenge Is... Facebook page that The Nutritionist Reviews sent me(2/2 entries). but I also love the Fading Away (sm)! My daughter would LOVE the "if you love us, save us" panda t for kids. I would love the Extinction is Forever Shirt! I like your Facebook page. (Annemarie Zito) Post 1. I like your Facebook page. (Annemarie Zito) Post 2.
subscribed through GFC under Tina R.
I would love the My Skin is My Sin tshirt. I work at a zoo on the weekends and this would definitely make a loud statement! I wrote on the Revenge is...page that you sent me! I would get the Southern White Face Owl tee! I would get the Women's RPET - Peace shirt. I like Revenge is on FB. Samantha M.
1. I like you on FB. Samantha M.
2. I like you on FB. Samantha M.
If you love us, save us...the panda bear shirt for kids its adorable!! I told them that you sent me! I love the Southern White Faced Owl shirt but I also Like Fading Away. I don't want them to fade away, so I might have to go with that one. Lovely giveaways thanks for the chance to win and fine whole product reviews by the way.